Also kind of funny, in my opinion. I’ve always advocated for fact-checking as well as not trusting every single thing read on the Internet. Mainly because people post satirical articles without knowing that they’re satire and then run with it, but in today’s new age of media, now than ever I urge you to check where your information came from if you suspect it’s outrageous. Being as someone who wants to have a career in the media and news in particular, I’m not weary of everyday news. If your local reporter tells you about something, I’d trust him/her. However, if you come across some off-the-wall website saying that Pope Francis is dead, or something that sounds like a conspiracy theory, I’d again, check your sources. That’s what I will leave you with: some advice and a little summary of my experience in my media writing course. I liked this class. It wasn’t stressful and it made me think about media criticism and how a lot of it is just ill-informed. I also got to learn about broadcasting, which is something I didn’t know anything about. I think that broadcasting would be the most fun career in media, but it also sounds the most hectic. I changed my major during the course of this class and I’d like to say that decision was influenced by learning about media careers and what I don’t want to do. All in all, I gained a newfound respect for people in all positions in the media and I enjoyed the time I spent in Media Writing. However, I still strongly advocate for the usage of the Oxford comma, no matter what the AP Stylebook says. Generally, when I am interested in something, I want to know the full story. I’m not the type of person who can be satisfied with only reading headlines or only knowing 15-second soundbites worth of information. I understand broadcast journalism is beneficial and more acclimated to appeal to audiences with just the facts and what needs to be told. Nothing more, nothing less. However, I don’t want that. I want the full story. I want to know everything. That’s not available with broadcast journalism. Broadcasting is directed towards a need-to-know basis of information. 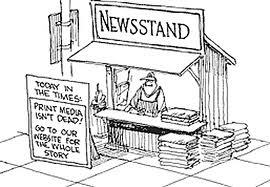 Print journalism is the opposite. Print media has always been my favorite type of way to get information. This is why I really love investigative journalism as well. I love people who are dedicated to telling the full-on story, no matter how long it takes. Although print media can be bad for the environment through means of a wide use of paper, there are alternatives such as being available online. Many newspapers such as the New York Times and The Wall Street Journal are converging to online media as well. The necessary information is still available, just in a different format. Although broadcast journalism is more entertaining and I wildly respect broadcast journalists, I will continue to be a dedicated supporter of print media.. The true passion in journalism lies in the effort to do whatever it takes and go wherever needed to tell a story. Journalism can be an incredibly dangerous career, especially when in war conflict zones. More often than not, freelance journalists are the ones who are traveling to places like Syria in order to get the story in hopes of turning a profit and telling a story that so desperately needs to be told. There are many problems with reporting in conflict zones, and these are increased when freelancers decide to risk their lives and travel by themselves to war sites. For instance, even before arriving, many represented journalists receive training. More often than not, freelancers forgo training because it is too expensive. This puts the journalists highly at risk. Nearly half of the 72 journalists covering Syria who were murdered were freelancers. Other problems associated with freelancing in conflict zones are that they receive little pay due to outsourcing and finding insurance is incredibly tricky. These journalists have no cultural understanding of the climate of which they are in and this is highly dangerous. Ultimately, there needs to be a push for better protections and training for freelancers in conflict zones. This should not be taken lightly. Alpha Tau Omega here at The University of Southern Mississippi is hosting their 32nd annual crawfish boil philanthropy event benefitting Fisher House. Fisher House provides housing and transportation to military families who are receiving major medical treatment. Fisher House provides housing and transportation to military families who are receiving major medical treatment. The event will be held on April 29th. Tickets can currently be bought online at a pre-sale price of $20. Physical tickets can also be purchased from any Alpha Tau Omega member. Sponsorship packages and donations are also accepted and appreciated.